While most traders share the same goals, they achieve these goals using a variety of different trading styles. Trading styles can be molded to fit a trader's time restrictions, profit goals, and personal strengths. There is not one trading style that is better than any of the others, however it is important to define your style so that all of your future efforts are organized and intentional. Regardless of the financial instruments, there are only two types of trades. Long trades involve buying to open the position (enter) and selling to close the position (exit), with the intent of selling at a higher price for a profit. 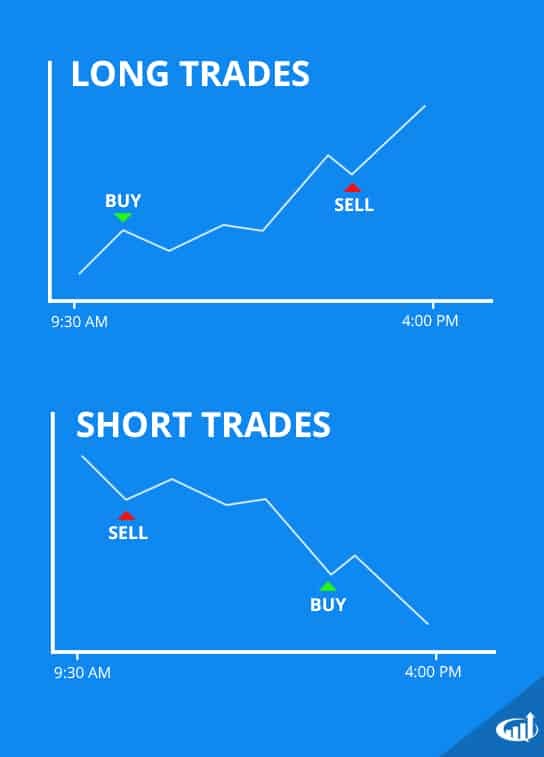 Short trades involve short selling to open a position and buying it back, known as covering, to close the position, with the intent to cover at a lower price for a profit. Most traders and investors are more familiar with long trades, utilizing the "buy low, sell high" mentality. This type of trading is relatively straightforward and can be done with most trading accounts. Short selling, however, requires a margin account. Short selling is the process of borrowing shares at the executed price and returning the shares when the position is covered and closed out. The process of borrowing shares is done electronically through the broker. Brokers usually provide a daily updated list of stocks available to short. Broker platforms will also typically warn when specific shares are not available for shorting. There are two styles of day trading which are loosely based on the position holding time. Both styles should be managed with the risk and probability precept in mind. Intra-day pertains to a single 24-hour period or a single session from open to close. During that intra-day period, a day trader can perform scalps and/or swings. When a position is held overnight and/or multiple days to weeks, this is consider daily swing trading. Scalping is performed intra-day. It captures the essence of day trading, by trying to complete round trip trades for profit in the shortest period of time ranging from seconds to minutes. Scalping tends to prioritize the shortest time frame charts like one-minute and five-minute time frames. The profit targets are also smaller in order to sustain a high probability to justify the larger position sizes. An example of a scalp would be buying 2,000 shares long on XYZ at $26 and selling the 2,000 shares at $26.15 approximately three minutes later for a $0.15 profit on $2,000 shares resulting in a gross profit of $300. On the flipside, the same 2,000 share long position at $26 might drop to $25.85, resulting in a negative $300 loss, if the trader takes the stop-loss. Day traders who scalp need to be disciplined enough to take stop-losses as well as profits. While many day traders are fond of scalping stocks to make quick profits with larger positions, other day traders are looking for bigger moves in the market. These day traders, often referred to as momentum traders, are looking to take advantage of bigger intraday moves in a stock. For example, a momentum trader may see a stock breaking out at $10 and initiate a position of 1000 shares with an $11 profit target. This profit target is much higher than that of a scalper. If the trader's hypothesis is correct, he/she will make a $1000 profit during the day. Swing trading utilizes the similar principles as day trading but uses a longer holding time period. Swing trading can be performed intra-day or daily. A shorter-term swing trader may focus on the wider time frame charts like a 15-minute or 60-minute and daily chart. Since the trading range may also be larger, a swing trader may take a smaller position accordingly. A day trader may be looking for an intra-day swing trade price target of $27 on XYZ. The trader may decide to swing the stock from $26. Since the target is larger, it will inherently have more risk from the longer holding time therefore the trader may adjust the size to a 400 share long position. Daily swing trading involves an even larger time frame and price range. A swing trader may opt for a $28 price target utilizing the 60-minute, daily and weekly charts with only a 200 share long position. Each of the scenarios follows the risk and probability precept. A hybrid style that utilizes both is also very common. A day trader may start the a trade as a scalp with 2,000 shares long and take profits on 1600 shares and continue the trade as a intra-day swing position on the remaining 400 shares. This allows the day trader to efficiently offset risk exposure to allow for a longer holding time period. Day traders and swing traders utilize similar strategies but different timeframes.